“I go for the lowest common denominator. Just get some stuff in front of the camera and get some action out of it. Get the most I can out of those figures before they wear out …” Offbeat documentary directed by Brett Ingram (Rocaterrania) explores the fascinating life and work of legendary underground clay animation artist, Bruce Bickford, who collaborated with the late, great Frank Zappa on a number of projects such as the 1979 concert film, Baby Snakes. The unassuming, iconoclastic Bickford works out of a basement studio near Seattle perfecting his “hallucinogenic style of animation.” This ain’t Gumby and Pokey, folks. Some of Bickford’s clay animation works are truly disturbing! And Bickford is a truly fascinating character who shares a little of his eclectic outlook on life: “Isn’t it remarkable? This little planet we’re on … Is this the headquarters for something?” In addition, Monster Road introduces us to Bickford’s equally eccentric father, George, a retired aerospace engineer who is suffering from the onset of Alzheimer’s Disease. 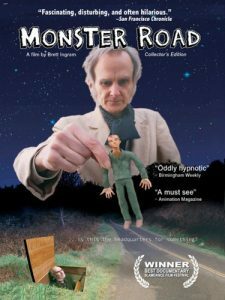 Monster Road won “Best Documentary” at the 2004 Slamdance Film Festival and later aired on the Sundance Channel.